Devotional Altar. David Ouellet (1844-1915). Gilded and polychromed wood. 1902. This altar is dedicated to the Child Jesus. The statuette is located in one of the most symbolic places in the Monastery. 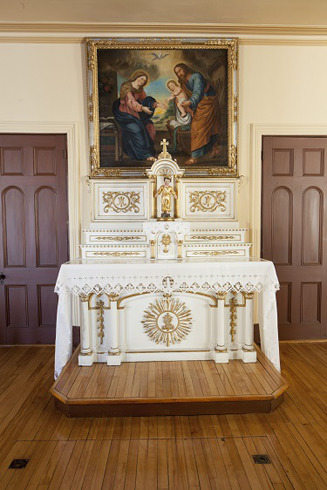 An important rite of passage in religious life took place here: novices would receive their first habit, and were welcomed into the community at this spot. This is also the way through which we enter the interior chapel every day for Mass. In the past, we would follow behind the boarders, in silence, with our hands hidden in our large sleeves. Young girls were always astonished to see us walking this way, because our habits brushed the ground, and we appeared to be floating.